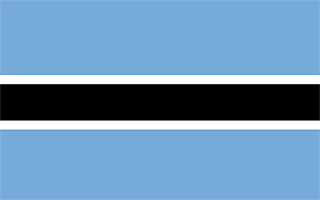 Botswana with its capital Gaborone is located in Africa (Southern Africa, north of South Africa). It covers some 581,731 square kilometers (slightly smaller than Texas) with a population of 2,214,860. English and Tswana are the languages spoken by people in Botswana. Namibia, South Africa and Zimbabwe are bordering countries. Botswana is a land-locked country located in Southern Africa. Botswana is famous for its wildlife areas like the Chobe National Park, Moremi National Park in the Okavango Delta or the Central Kalahari Game Reserve. The bulk of the Kalahari desert falls within Botswana's borders and Botswana is home to most of the world's San (bushman) population. People in Botswana are very friendly and the crime rate is low. There isn't much to worry about on this front. The northern part of Botswana, including Chobe National Park and the Okavango Delta is in a malaria zone, so it is advisable to take the relevant precautions. Seek medical advice before travelling to these areas. To reach someone Botswana dial +267 prior to a number. The local cellular networks are operated on 900 MHz, 1800 MHz, 3G, 4G. Websites typically end with the top level domain ".bw". If you want to bring electric appliances (e.g. battery chaarger), keep in min the local 230 V - 50 Hz (plugs: D, G). The sign for the locally used currency Pula is BWP. Light blue with a horizontal white-edged black stripe in the center; the blue symbolizes water in the form of rain, while the black and white bands represent racial harmony.